See the GitHub page to download the code, view installation instructions, or see details on the examples that come with the package. 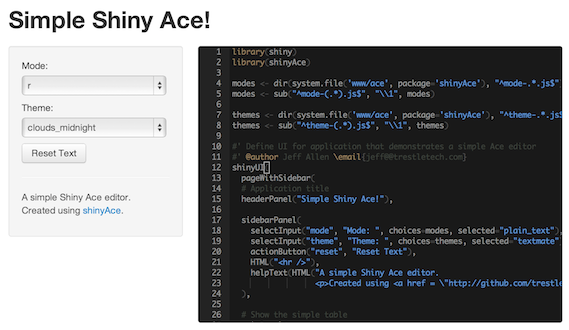 These examples showe how to create Shiny applications that use shinyAce to allow users to edit and run R code, R Markdown, or even another Shiny user interface. You can view a description of all the examples (and instructions for running them) on the GitHub page. Feel free to let us know if you have any issues or feature requests on our Issues page.